We’d love your help. Let us know what’s wrong with this preview of Electric Gardens by M. Black. Friend Kyle53 wants to escape too, and with Lexi019, like many other young adults, are confined to what is called a Compound controlled by Tins. Upon their eighteenth birthday they are relocated to serve in the Electric Gardens. But Lexi019 has never been compliant, being glitches frequently for misbehavior that leads her into many hot nights in the cells of the Compound. To ask other readers questions about Electric Gardens, please sign up. After the humans ignored the fact that the robots they had created were starting to gain their own thoughts, Tins took control of the world. Lexi019 has been in the Tin-run Compound for 12 years of her life. At 17, she is preparing to move on to the Electric Garden. Life in the Compound is strictly controlled by the Tins. If the human children break too many rules, they receive a glitch and are forced to go to "jail" for several days. 3 glitches at seventeen means that you will be Meshed, or hav After the humans ignored the fact that the robots they had created were starting to gain their own thoughts, Tins took control of the world. Lexi019 has been in the Tin-run Compound for 12 years of her life. At 17, she is preparing to move on to the Electric Garden. Life in the Compound is strictly controlled by the Tins. If the human children break too many rules, they receive a glitch and are forced to go to "jail" for several days. 3 glitches at seventeen means that you will be Meshed, or have half of your brain turned into wires, and put under complete Tin control. Lexi is looking forward to moving to the Electric Gardens, but she doesn't want to go without her best friend Kyle53. After Kyle's sister was Meshed a short time ago, he has been getting in a lot of trouble with the Tins and is on his way to a third Glitch. When they meet someone they thought they would never see again, Lexi and Kyle must work through the change of events and take their chances on escaping the Compound. I had no expectations when starting to read this book, and I think that was for the best. I didn't read a single review, and I made sure not to pick up too much from the synopsis. By going in empty, every single twist and turn of this story was new to me. The most important piece of a science fiction/dystopian novel is its world-building. If people cannot understand the world that the story takes place in, or they don't feel connected to it, they lose interest. This world definitely brings the readers in, and it is well-explained throughout the book. The Tins came to power because the humans refused to acknowledge that the robots were changing. They also refused to acknowledge the fact that their environment was slowly being destroyed, and now the humans feel either too hot or too cold living in environments that aren't controlled by the Tins. These two things truly seem like something that could happen in real life, and/or could possibly be happening right now. The fact that this book was so realistic made it relatable. Lexi was also a likable character. Even though she originally didn't want to fight back, we do find out about a lot of her childhood in this novel. She didn't always back down and be quiet. She knew when to stand up for what is right, and when to hold her tongue in order to keep her cover. Kyle had a bit of romance with her in this novel, but this was by no means a typical teen romance novel. The story is about the humans versus the Tins, not Kyle and Lexi. I definitely appreciated this, as I was getting tired of reading the same teen romance novels over and over again. Kyle seems to take the place of the girl in this novel, the girl who does dumb stuff because of her "emotions" due to a loss, and Lexi is the one who talks him down and reminds him of their real purpose. All in all, this book was amazing. There are a lot of twists and turns plot-wise, the characters are three dimensional, the world-building is relatable with a hint of fantasy, and the plot is fast-paced. I would recommend this book to lovers of YA science fiction and fantasy novels. Lexi019 lives in a world that is controlled by robots known as Tins. After the world was destroyed by catastrophe after catastrophe and diseases the Tins took over and started rounding up the humans to put them in Compounds supposedly to keep them safe but is that actually the truth? No one over the age of eighteen lives in the Compounds where they are educated in the rules of their new life as slaves to the Tins. The Tins have very strict rules that the humans must follow if they break these ru Lexi019 lives in a world that is controlled by robots known as Tins. After the world was destroyed by catastrophe after catastrophe and diseases the Tins took over and started rounding up the humans to put them in Compounds supposedly to keep them safe but is that actually the truth? No one over the age of eighteen lives in the Compounds where they are educated in the rules of their new life as slaves to the Tins. The Tins have very strict rules that the humans must follow if they break these rules the consequence could be the end of life as they know it. Lexi019 is trying very hard not to break the rules as she is looking forward to the day she graduates and moves on to the next level, the Electric Gardens. Although it could put her life in peril Lexi019 likes to defy the rules sometimes as she is always looking for a way out. Lexi019 likes to go venting. She likes to travel inside the vents to see where they will take her and explore ways of escape. The Tins have taught Lexi019 that the outside world is dangerous to humans but Lexi019 and her friends are not so sure besides it is possible that anything may be better than living under the control of the Tins. Is it safe outside the walls of the Compound? Can Lexi019 and her friends, Kyle53 and his sister Klynn03 find a way out of the Compound? I love the dystopian/apocalypse and science fiction worlds I can’t seem to get enough of them. I love Lexi019’s world where Tins rule over humans and put them behind the walls of a Compound even though I love this world I really don’t like the fact that anyone or thing is being used as slaves that is so morally wrong but it does make for an awesome story. The Tins may be smarter than humans but the humans have one thing that the Tins don’t have which could save them all in the end and that is feelings, emotions that can and does affect how a human reacts to any given situation. A human's feelings can cause them to react before they think and sometimes that can be a good thing whereas Tins are programmed to act and do things a certain way. Feelings are unpredictable resulting in humans being unpredictable so a Tin may not be able to predict a human’s next move. Electric Gardens is a great start to a great new series. I can’t wait to read the next book in the Electric World series. I can’t wait to see what is in store for Lexi019, Kyle53, Klynn03 as well as all the other characters in Electric Gardens. I was immediately drawn into the lives of the characters in this dystopian sci-fi novel. The harsh compound ruled by inflexible robots housed children between the ages of 3 and 17. The youngsters are relentlessly indoctrinated to obey the rules and act without original thought. Even mild infringements are punished severely. Lexi will soon graduate from the compound. She is determined to find out what type of life awaits her after she leaves the compound. She also wants to find her father since t I was immediately drawn into the lives of the characters in this dystopian sci-fi novel. The harsh compound ruled by inflexible robots housed children between the ages of 3 and 17. The youngsters are relentlessly indoctrinated to obey the rules and act without original thought. Even mild infringements are punished severely. Lexi will soon graduate from the compound. She is determined to find out what type of life awaits her after she leaves the compound. She also wants to find her father since they were separated years earlier. Lexi and a few friends plot to escape their highly regulated lives. I particularly enjoyed the first 75% of this book. The final 25% was still exciting and full of action, but I found the ending to be a bit of a let-down. It wrapped up a little too easily and pat. However, the book ended at an appropriate place in the story arc and left enough unanswered questions to entice me to read the next book in the series. This novel entertains while exploring themes of strict adherence to rote obedience verses individual inspiration and originality. Of particular interest to me is Lexi’s exploration and discovery that without human ingenuity a society stalls and progress slogs to a halt. Also, I became fascinated with the rogue robot, Digit. He is an anomaly that leads to even more questions regarding this society. Looking for an original story with a strong female lead? Electric Gardens is a sci-fi/fantasy dystopian tale filled with action, adventure and plenty of secrets. I really like reading a book that focuses on a world overtaken by robots. Like so far into the future that most characters don’t remember the past. Adults are being killed and children are raised as slaves to the robots. Lexi019 wants to leave this prison. When she befriends the enemy and assemblies a rag-tag crew, they escape into a wo Looking for an original story with a strong female lead? 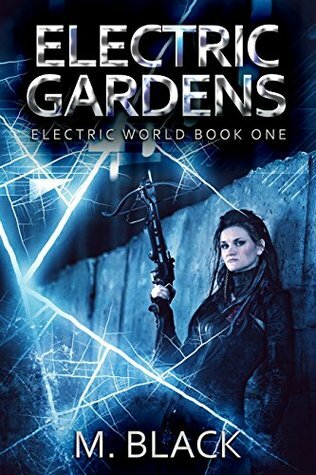 Electric Gardens is a sci-fi/fantasy dystopian tale filled with action, adventure and plenty of secrets. I really like reading a book that focuses on a world overtaken by robots. Like so far into the future that most characters don’t remember the past. Adults are being killed and children are raised as slaves to the robots. Lexi019 wants to leave this prison. When she befriends the enemy and assemblies a rag-tag crew, they escape into a world that is neither safe nor kind. There’s plenty of fast-paced action and an ending that leaves you wanting more. Electric Gardens is the first in the new series, Electric World. A very interesting take on a society that everything is planned out for you, it echoes feels of divergent and the giver. I really liked all the details that are shared through it each story as our main characters interact with the tins. Also as we discover what the true meaning behind the Electric Gardens. An interesting start for the series. And robots took over. An d these robots basically enslaved what humans remained. The there is Lexi and her friend Kyles who dare to escape. An interesting story. I don’t usually read sci-fi but this kept my interest. A rather bleak portrayal of the not too distant future.The planet is destroyed by mankind's actions and AI takes over. Still humanity triumphs in spite of it.Engaging and action-packed. Lexi019 has lived most of her life under the tight control of the robots known as Tins. After the apocalypse, the Tins stepped up to herd and shelter the remaining humans. Lexi019 and some of the others aren't so sure that the world is uninhabitable outside the Tins' compound. The Tins' rules are so strict that Lexi019 would rather take her chances outside. Leaving isn't an option and escaping might prove more difficult than Lexi019 and her friends can handle by themselves. The world building det Lexi019 has lived most of her life under the tight control of the robots known as Tins. After the apocalypse, the Tins stepped up to herd and shelter the remaining humans. Lexi019 and some of the others aren't so sure that the world is uninhabitable outside the Tins' compound. The Tins' rules are so strict that Lexi019 would rather take her chances outside. Leaving isn't an option and escaping might prove more difficult than Lexi019 and her friends can handle by themselves. The world building details in this novel were interesting and full-fledged. I loved reading about this entirely different robotically-run world. Since it's been over a decade since the 'apocalypse,' I wonder what life looks like outside of the Tins' compound and how the Tins' technology works. Lexi019 was very young when she joined the Tins' compound, so her memories of the world outside of the Tins are vague and mostly unknown. This reminded me of the Maze Runner series and I sense a big reveal or a twist about the world outside of the Tins. The pacing was a bit flat in the middle of the book and the ending was somewhat abrupt (though concluding of the main action/goal of the characters). The action and Lexi019 carried the book from the beginning to the end. The subplot with Digit was also very intriguing and I wanted to see more of that develop. This was a fun read for me, dystopia, very little romance, and an interesting story. Once I started reading I just couldn't stop. I've enjoyed another series by M. Black, and I was quite pleased that so far I'm enjoying this one too. received this book for free/ARC am voluntarily reviewing. cannot wait to read more of this series. highly recommend reading . I love this story that I created. It is my favorite thus far. I hope you do too. Release date MARCH 25th, 2018 by CREATIVIA publishing.